Six friends from the Class of 2004 gathered their future Raiders for an impromptu photo shoot during a campus visit last summer. Read more in Raider Nation. What do you call a 2,000-pound great white shark launching itself through the air? Scientists call it "breaching," and Lacey Williams '16 calls it "work." She's studying predatory behavior in sharks off the coast of South Africa. Read the full story here. 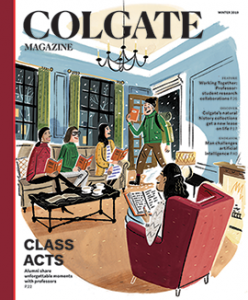 Outwitting Soviet officials, setting his own slacks alight, calling into a book club meeting from across the Atlantic — professors have left indelible memories in the minds of alumni, who share their tales in this issue's cover story, Class Acts. Between winning MVP in this year's Patriot League soccer tournament and majoring in chemistry, Oliver Harris '19 has a lot on his mind. Luckily, he shared his thoughts in our interview with the soccer star. The focal point of the Quad, Memorial Chapel was built in 1917 with a gift from Mary Colgate in honor of her father, James B. Colgate. The chapel’s first event was convocation in September 1918. Ever since, it has held religious ceremonies, memorial services, weddings, orchestral concerts, and countless Dancefests. Like these census workers digging through a mountain of information in 1940, Associate Professor of History Dan Bouk mined the census to discover the stories told in the government's massive store of data. Read more about Bouk's and other Colgate professors' research in Research Review. Are all men truly created equal? What is the basis of morality without religion? Professor of philosophy David Dudrick grapples with these questions in My Journey with Nietzsche. In two years, Dana Slosar '16 went from studying German at Colgate to rubbing shoulders with celebrities at glitzy fashion shows. In between? She spent her time competing in and (spoiler alert) winning Asia's Next Top Model. Read the full story here.